A portrait of Dr. B.R. 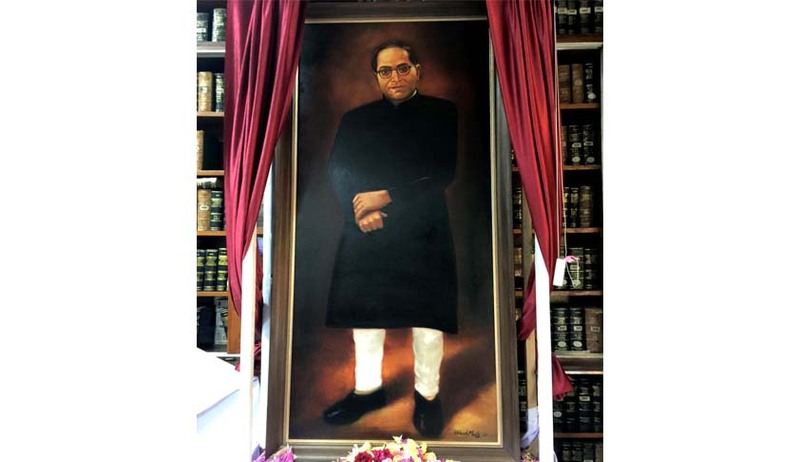 Ambedkar was unveiled today in SCBA Library-I by Mr. Gopal Gandhi, grandson of Mahatma Gandhi, in the presence of Mr. Paresh Maity, Padma Shri and renowned artist. The function was attended by a large number of members of the Bar. Justice Kurian Joseph also joined the event. The function was also attended by a sizeable number of Senior Members of the Bar, including Mr. and Mrs. F.S. Nariman, Mr. Ashok Desai, Mr. P.S. Narasimha, ASG among others. The portrait has been painted by Mr. Paresh Maity, who is an acclaimed Indian painter, on the request of the President of SCBA. His works are in a number of collections, including the British Museum, and the National Gallery of Modern Art, New Delhi. He has also painted for Terminal 3 at Delhi Airport, which stretches up to over 850 feet. Mr. Maity, was also conferred with fourth-highest civilian award the Padma Shri, in 2014. Speeches were delivered by Mr. Gopal Gandhi and Mr. Dushyant Dave, President, SCBA. Mr. Dave said that the Nation must be eternally grateful to the Constituent Assembly, the drafting Committee and its Chairman Dr. Ambedkar. He thanked Padmashree Paresh Maity for the portrait. He also elaborated on his choice of inviting Mr. Gopal Gandhi for unveiling the portrait. He said that such a choice was made to “keep politics out of the Bar”. They hence desired a civil society representative to do the honors. He also expressed a retrospective dream, according to which, Congress should not only have let Dr. Ambedkar leave the Ministry, it should have offered to him, in 1952, the newly-created office of the Vice President of India.